"From Memphis, Tennessee, one of the best bassmen in the business." - Elvis, on stage, 1954. William P. Black, "Blackie", was born in Memphis, Tennessee, on Friday, 17th September 1926. He would grow up to be a well built man, standing around the six foot mark. Like Elvis', and many other families of the period in the south, his family wasn't a rich one. Apart from Bill, there were younger brothers Johnny, "Jack" (who would also become a musician), and Kenny, and sister Mary-Ann. Their mother, Ruby, and the family at one time lived in the same Lauderdale Courts housing project, in Memphis, as the Presley's. Indeed, Ruby and Gladys are said to have been on friendly terms (I have found no reference to Ruth's husband and the childrens father). Bill had left home before the Presley's moved into the building. While he had been doing his military service in Virginia in the mid-40's, Bill had met 18 year old Evelyn. They married a year later, in 1946. Eventually they would have three daughters, Nancy, Louise, and Leigh-Ann. 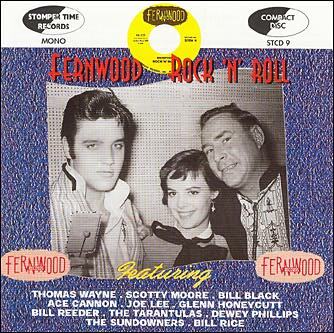 Returning to Memphis, following his stint in the U.S. army, Bill worked at Firestone Tyres and Ace Appliance Co., plus played in one or two local groups, before joining up with the Starlight Wranglers. As was common at the time Bill was growing up, people entertained themselves by playing an instrument. At the start of Bill's musical career, his choice was known as a "dog house" bass. The reason being that the acoustic instrument was big enough to house the family hound dog! Prior to the link up with the Wranglers, Scotty Moore and Bill Black once backed up local boy Dorsey Burnette at a club. Johnny Black too worked at Firestone. He then moved out to Corpus Christi, but would head home to Memphis with his wife after hearing "That's All Right", and knowing that something was breaking musically in the city. He very much wanted to be a part of whatever it was. The same thing would take place all over America from 1954 onwards, bringing people like Carl Perkins, Johnny Cash, Jerry Lee Lewis, and Roy Orbison, to Sun Records. Johnny Black can be seen in Alan Freed's rock exploitation movie, "Rock, Rock, Rock", made in Hollywood during 1957. He's playing bass with the Johnny Burnette Rock 'N' Roll Trio, where he replaced Dorsey. While Elvis would claim in 1956 that he'd never met Scotty or Bill before Sun Records, he was friendly with Johnny Black, so must have at least been aware of older brother Bill. Johnny was actually said by some to be the better bass player of the two. The Starlight Wranglers were a Sam Phillips group. Scotty met Sam in 1952, after the guitarist had come out of the U.S. navy. His day job at the time was cleaning and blocking hats at his brothers' dry cleaning firm. Bill was with the group for almost three years before Elvis came on the scene. At the time Doug Poindexter was the featured vocalist. With Scotty as leader, they issued the Sun single "Now She Cares No More For Me"/"My Kind Of Carrying On" (SUN 202), on Saturday, 1st May 1954. Millard Yeow (Firestone) - fiddle. Following Elvis' early sessions, solo visits to the Memphis Recording Service, to cut two personal acetates, Sam had Scotty arrange for the young singer to come over to his home for a try-out session. Scotty also had Bill come by later in the session, which is said to have taken place on Sunday afternoon, 27th June 1954. The meeting lasted something like two hours. After Elvis had left, Scotty asked Bill what he thought. Bill replied, in his typical blunt style, "Well, he didn't impress me too damned much!" Sam Phillips remembers that he one time warned Elvis that Bill was this way, and would be likely to get in his face from time to time, tell him he was no good or couldn't sing, "But that was just Bill's way. Don't pay him no mind." When it was asked of D.J. Fontana, how he and Scotty got on with Bill, during a trip to Scotland in October 1993, since it was well known that Elvis didn't get on with him, D.J. replied that that wasn't so, "No. Bill was the friendliest guy in the world." Despite any misgivings Bill might have held after that first short meeting, the two began to work with Elvis in the tiny studio at 706 Union Avenue, an address they were destined to make world famous. According to Evelyn Black, in those early days, both Bill and Scotty done much to teach the nervous young singer his stage-craft, the way he would stand at the mike, and also some of the ways to move. After various attempts at songs, the group "stumbled upon" the sound which gave them "That's All Right (Mama)", on Tuesday, 6th July 1954. Following on from that number, it's said to have been Bill who jumped up and started to mess about on "Blue Moon Of Kentucky", the eventual B-side to their first single. He plucked like crazy at the strings of his 'dog house', and sang the lyrics in a high falsetto voice, bringing both amusement and inspiration to those present. The single version, like most of his Sun work, features fine bass work from Bill. On Saturday, 16th October 1954, Elvis, Scotty and Bill appeared on the "Lucky Strike Guest Time" segment for new artists on the very popular "Louisiana Hayride" show on KWKH out of Shreveport. They were introduced by Frank Page and performed both sides of that first release (SUN 209). The show was carried by 190 CBS stations across the south, between 8pm.- 11pm., and there's no way to measure the huge boost this gave the boys and their style of music. With things going so well, the three quit their day jobs, also around October '54. At the start of the "Hayride" contract, Elvis got 18 dollars and Scotty and Bill 12 each. As well as the "Hayride", which they would perform on at least fifty times, well into 1956, there were countless one-night stands which also made them tight as a unit and helped establish them. It was the beginning. There are conflicting opinions on Bill's ability as a bass player. As I've already noted, some thought Johnny was the better of the two. Whatever he might have lacked in technique in those early years, he more than made up for with enthusiasm and stage presence. Quite often it was his joking around that took some of the heat off of Elvis, making the crowd laugh at Black's comedy routines, and stopping them running the Mississippi Tupelo Flash out of town on a rail! Bill's bag of tricks ranged from blacking out his front teeth, to swinging his arm out real far, slapping the strings of his bass, and dancing with or riding it! All of this was sometimes done while he was wearing an oversized pair of bloomers! Some of his vocal horsing around can be heard at the start of a "Hayride" version of "That's All Right", which is widely available these days. Other tracks have him screaming and shouting in the background. Visually, a glimpse of Bill's act behind Elvis was caught during the "Milton Berle Show", on the deck of the U.S.S. Hancock, at the Naval Station, San Diego, on Tuesday, 3rd April 1956. He gets so worked up during "Blue Suede Shoes" that, at one point, he looks like he's just about to ride his instrument off into the sunset! Scotty commented, in Scotland during October '93, that, "If it hadn't been for Bill, we would have bombed so many times in the early days. What you don't realise is that some of the crowds had not seen Elvis. They'd heard the records, but they had not seen him. They're sitting there like, "What is he?" And Bill would start riding the bass and clowning, and get the crowd loosened up. Once he'd done that, then Elvis would have them in the palm of his hand. He was winding them up for us." Even Sam Phillips has been quoted as saying that, "Bill was one of the worst bass players in the world, technically, but man, could he slap that thing!" With all the touring, it almost seemed that the large bass had a permanent bunk on the roof of the car back then. In 1954 it fast became a battered looking object, resembling, according to author Peter Guralnick, something, "held together with baling wire." While the thousands of miles might have been destroying the bass, the recording sessions, radio work, and concerts, had seen the friendship between the three men grow in leaps and bounds, confidence building with each new experience. It was during one of these hectic tours, during 1954, that Bill is credited with totalling Elvis' 1951 Lincoln Continental. This was after it had done some 20,000 miles. He ran it under a truck while playing a date in Arkansas. Following this, Elvis then purchased the '54 Cadillac which gained its place in his legend by burning up on the road when the wheel bearings locked with Elvis and a girlfriend out alone, near Texarkana, Arkansas. In May of 1955, Elvis gave both Scotty and Bill due credit. This was while talking with Mae B. Axton, "I really am lucky to have those two boys, 'cause they really are good. Each one of them have an individual style of their own." Mae would later receive co-writer credit, with Tommy Durden and Elvis, for "Heartbreak Hotel". Her singer/songwriter/actor son, Hoyt, would compose another track known to Elvis fans, "Never Been To Spain", covered in the '70's. Returning to Bill Black's character. Author Robert Gordon put it well when he said that, "Bill Black was an extremely affable, warm-hearted, and humorous guy who loved and appreciated the craziness in rock and roll." Speaking at the British Fan Club "Party", at Mablethorpe, on Wednesday, 3rd November 1999, longtime Elvis pal Red West commented, when talking about fun and games on the road, simply, "Bill Black was one of the craziest guys I ever met." Another comment from Scotty Moore tells how well Bill got on with everyone; "He never met a stranger." With his natural gifts of humour, warmth, and chat, Bill also had the job of hawking early Elvis photographs at those mid-SO's shows. You can hear him doing this during the unedited version of the Bob Neal, "Texarkana Interview", recorded for the radio in Memphis during August 1955. Here he says he'll have a, "Brand, spankin' new pose of Elvis for a picture. And they'll be sellin' the same ol' price of only a quarter. And I'll have about four or five million of them. I'll have plenty of 'em, before the show, during the intermission, after the show. The fact is, I may sell them out there all night long!" During 1955, for a short time, the boys went under the united name of the "Blue Moon Boys". But that wasn't destined to be the way history would remember them. Around the mid-SO's, Elvis' family moved opposite Ruth Black. She'd joked with Bill and Johnny's wives that the "pretty boy" was her boyfriend! By late 1955, the three had added drummer D.J. Fontana to their ranks. They'd met and become friends at the "Hayride", where Dominic Joseph was the staff drummer. By then Colonel Thomas Parker was also in charge and making various deals. It seems to have been an idea of his that the band go on a fixed salery. Scotty and Bill paying D.J. out of their 100 dollars a week. This caused a lot of bitterness at the time, including threats to quit. At one point the Colonel is claimed to have wanted to drop Scotty and Bill, and bring in Hank Snow's backing group for Elvis. Bob Neal, still the manager at the time, had enough power to nix that idea. Bill, like others involved with Elvis, thought little of the Colonel, and had no time for him. With Elvis receiving 50% of the fees, and Scotty and Bill splitting the other 50%, paying D.J. and expenses, there was not much left. Colonel Tom also told Bill to cut back on the clowning around on stage. It was Elvis' show. The people had come to see, "Ma boy", and the rest of them were just the support. It appears that the spirited act from Bill during "Blue Suede Shoes" on Berle's national tv show was the final straw for Parker. He called a halt to such things. No one would steal Elvis' thunder again, "Blackie's" routines were history. The line was being drawn. Fun and games still continued away from the spotlight. An example of off-stage fooling around was described by D.J. in October '93, when talking about a mid-SO's trip to San Antonio, Texas. "We all went down to (Scotty's) aunt's and ate food there. Then that night, after the job, we went back to the hotel. Bill was with him. He (Elvis) was standing at the edge of the pool and me and Bill got behind him and pushed him in. There must have been fifteen or twenty people there, kids, so they all jumped in behind him. The manager came out. He was going to put us in jail. That's all it was. It wasn't nothing dirty." The Colonel also had a habit of complaining to the other musicians about one thing or another, which had or hadn't been done for his "boy". Recording for their new company of RCA went well though, despite all of this background 'noise', and Bill contributed a simple but very effective 'plodding' bass line to "Heartbreak Hotel", the song which would introduce Elvis Presley to the world stage, and young musicians in so many other countries. These would include Liverpool teenagers John Lennon and Paul McCartney. Between the 23rd April and 6th May 1956, Elvis, Scotty, Bill and D.J. appeared in the Venus Room of the New Frontier Hotel, Las Vegas. The final show surfaced on "Elvis Aron Presley" in 1980. There is some film footage from the period too. You hear a competent unit before a largely unresponsive audience of older gamblers. Elvis was on a 12,500 dollar fee, per week. He was tagged the "Atomic Powered Singer", and backed by his group and the Freddy Martin Orchestra (he worked with such other big names as Judy Garland). It made for a strange mix. Elvis was cancelled after two weeks and wouldn't appear in the town before July 1969. The best thing to come out of the Vegas stint was the group catching Freddie Bell and the Bell Boys doing an outrageous version of Leiber and Stollers "Hound Dog". Elvis liked what he heard and we all know where that led. Bell's version, meanwhile, came out on a single in 1955 (TEEN 101), backed by "Move Me Baby". During 1956, when asked for his favorite tracks, Bill named "That's All Right" and "Hound Dog". By 1956, the friendship was already pulling apart, with Bill, Scotty and D.J. not seeing too much of Elvis off stage. "It just can't be that way", was the quote from Bill at the time. But feelings were running deeper it seems. In December 1956, Bill said, "When we get together with Elvis and the Jordanaires we have a lot of fun. We practice a little bit. We never rehearse outside of record sessions. We have rehearsals, but we never rehearse, if you know what I mean." The first months of 1957 were taken up by the making of Elvis' second movie, "Loving You". The band hadn't been used on 1956's "Love Me Tender". They didn't like the Hollywood scene when they got there. It was too much sitting around with little else to do. Perhaps a good indication of how things stood can be seen in the often told tale of the recording session which produced "(You're So Square) Baby I Don't Care", on Wednesday, 8th May 1957. This was during the making of the classic "Jailhouse Rock" movie, Elvis' third. Bill was trying to come to grips with his first Fender electric bass. Legend has it that Bill just couldn't get the bass line right on the smaller instrument, and the bass track was everything to the number. In a temper, which was rare for him, he threw the guitar down and walked out. Elvis then picked it up and played the part himself. This seems to be backed up by the fact that Elvis cut the vocal track sometime after the backing was recorded. Meanwhile, Bill later made a complete transition to the electric bass and never looked back. For Bill Black though, the decision had been made. He and Scotty left again in 1958. Bill's final recordings with Elvis came on Sunday, 1st February 1958, when they cut "My Wish Came True", "Doncha' Think It's Time", "Your Cheatin' Heart", and "Wear My Ring Around Your Neck". 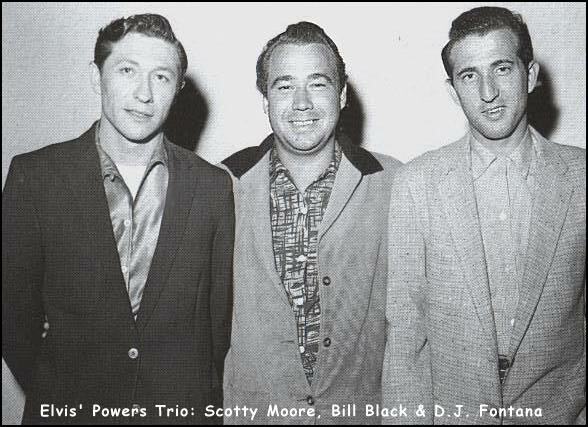 For Elvis' final 50's session, on the 10th - 11th June '58, Bill was replaced by Bob Moore, and Scotty by Hank Garland. It was truly the end of an era. For Elvis, his future now lay in Germany. For Scotty and Bill, the first show on departing from Elvis in '58, was back in Memphis. This was Wink Martindale's going away party. He was moving to California. Scotty Moore would later return to Elvis, and last with him from the first session after the army, in March 1960, until the historic Singer TV Special of June 1968. But Bill would never play with him again. On entering the army in 1958, according to Scotty Moore, Elvis never said 'goodbye' but, "So long. See you when I get out." Scotty hung in there, doing some recording and session work with people like Jerry Lee Lewis. Bill Black looked for a future elsewhere, he went after his dream, and a more permanent career within music. 1. Groundbreaking Sun sessions and such tracks as "That's All Right", "Just Because", "Blue Moon Of Kentucky". 4. First RCA sessions and such tracks as "Heartbreak Hotel", "Don't Be Cruel", "My Baby Left Me", "Hound Dog". 6. Classic movie "Jailhouse Rock". soon after the parting with Elvis. Reggie "Reg" - Young - guitar. Carl McVoy, an original group member, was the cousin of Sun rocker Jerry Lee Lewis, plus Mickey Gilley and evangelist Jimmy Swaggart. At one time Carl too recorded as a singer for Sun, cutting the single "You Are My Sunshine"/"Tootsie" (SUN INTERNATIONAL 3526). Later, Bobby Emmons joined the Combo on organ. He and Reggie Young would play on Elvis' classic Memphis '69 sessions, which would play such a major part in his late 60's comeback, producing the outstanding album "From Elvis In Memphis". That material being recorded at American Sound Studios. In 1959, the Combo signed to Joe Cuoghi's Hi label. There then followed a long period of rehearsals before any actual recording started. This done them nothing but good and they went on to become one of the most popular instrumental groups in the States during that final year of the 50's and the early 60's. Known as "The Untouchable Sound", chart success saw them receive Billboard's "Most Played Insrumental Group" award no less than three times in those years. Hits included "Smokie Part 2" (HI 2018), written by Bill, and "White Silver Sands" (Matthews) (HI 2021), in 1959 and '60. Bobby Vee and The Shadows had out a cover of the latter in March 1960. 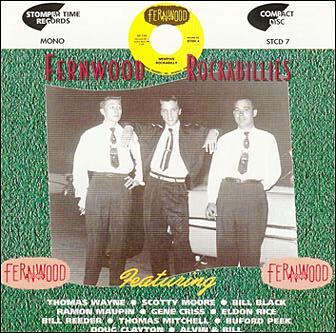 Their version being recorded at the Norman Petty Studio, Clovis, New Mexico, where Vee's idol Buddy Holly cut his hits. The Bill Black Combo also cut an instrumental version of Elvis' 1956 classic, on which Bill had played bass, "Don't Be Cruel (To A Heart That's True)". There were also a string of successful albums, like "Moving With Bill Black's Combo". In 1961, the group even ventured onto the silver screen, appearing in the film "Teen-Age Millionaire". "Blackie" was buried in Forest Hill Cemetary, Memphis. Gladys and later Elvis were also buried there, prior to their being moved to Graceland on Sunday, 2nd October 1977. Elvis didn't attend the funeral. His father, Vernon, did. Apart from the fact that he'd just completed "Paradise, Hawaiian Style" in Hawaii, he'd told Evelyn that he wouldn't go because he didn't want to turn a private affair into a circus by being present. Elvis and Priscilla later visited Evelyn and the girls at their home. D.J. wasn't at the funeral either. He'd left town to work around a week before Bill died. He'd known his friend was quite ill though, and thought it a matter of time until he was lost. He returned home to have his then wife tell him that Bill had passed on a few days before. Fontana called Evelyn, but the funeral was over and done by then. After Bill's death, there were a few more minor hits for the Combo, and they continued to tour and be a popular draw. Ace Cannon took over the group on Black's death, though the name remained the Bill Black Combo. Later outfits, like the Mar-Keys and Booker T. and The MG's would owe much to the music made by the Combo in its heyday. In 1997, the album "All The King's Men", featuring Scotty and D.J. Fontana, with various star guest artists, was released. Dedicated by the two men to their fallen friend Bill Black, it included one track with the Combo, "Goin' Back To Memphis". Written by Reggie Young and Bobby Emmons. The line-up for the reformed group included Reggie and Scotty on electric guitars, Michael Leech on bass, Bobby Wood on piano, Ace Cannon on saxophone, Bobby Emmons on organ, D.J. and Jerry "Satch" Arnold on drums. Reggie reunited the group at Scotty's suggestion, just for the one track. Former Beatle Paul McCartney again entered the picture when he purchased Bill's trademark 'dog house' bass, the one with the white trim that appeared with him on tv and film. McCartney has used the instrument on various recordings of his since 1979. In that year it featured on "Baby's Request", the closing number on the Wings album "Back To The Egg". It even added its sound to The Beatles 'reunion' track, "Real Love", in 1995. These three, later four, men, stood together while the world at large often condemned their every move and all they stood for. Could mere money destroy what was forged during those amazing years of 1954-1958? I somehow think not. The Bill Black Combo in the movie "Teenage Millionaire" 1961. Bill Black Combo during a club date in 1962. Bill Black Combo in the early sixties.